I don’t make new years resolutions, instead every year in early December I take time to reflect on the year that’s ending and decide what I missed. If what I missed feels important, I make a point of not missing it in 2018. What did I miss in 2017? A woman who’s been coming to my aquafit class at Hart House for 13 years died in December. She was a regular, always thanking me at the end of class. While I saw her week after week and would do what an instructor does with all participants), her death hit me enough that I felt the need to go to her funeral. At the funeral after hearing her family and friends talk about her life, I learned a lot about her. It saddened me that I never got the opportunity to get to know her well. In 2018, I want to get to know the people I see regularly better. Last year we were invited to my partner’s cousin once-removed wedding in Golden BC. I decided not to go with my partner because of several excuses (work conflicts, too expensive, never met them etc). It was a beautiful wedding on the top of a ski hill with lots of fun times in Canmore before the wedding. While I don’t regret not going, I feel it was an opportunity that would have been a fun experience. I don’t want to miss out on fun opportunities in 2018. 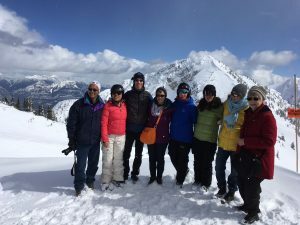 Some of the wedding party at Kicking Horse Ski resort. Not your average wedding reception! Sticking with the plan. I made plans to visit family or go to a lecture or something that looks interesting at the beginning of the week. The end of the week would come and I’d be exhausted and suddenly that plan that excited me at the beginning of the week doesn’t sound so interesting and I’d skip it. Last week I signed up to go to drop-in Improv for tonight. I’m tired and have other plans I could be doing but I’m sticking to my commitment because Improv is fun! Find purpose for things I do. This is a challenging one. When people ask me why I do my long distance walks even when I’m tired or the weather is crazy. I just tell them I like walking. But why walk for four hours in extreme cold (like yesterday -23c), I don’t have a straight answer or purpose yet but I’m making it my goal to find out this year.